Have kids design a balloon car, bring it to class, and see who's can travel the fastest and farthest. They could uses legos, soda caps, tops of fast food cups, or even cds for wheels. Tell kids to get creative with the car's body. They can make long thin cars or big fat boxed cars. Design elements are completely up to the kids. Their goal is to make a car that is not only fast, but can travel super far. In the classroom, have kids use their measuring skills to figure out the distance their vehicles traveled. Who's car has the most stamina? 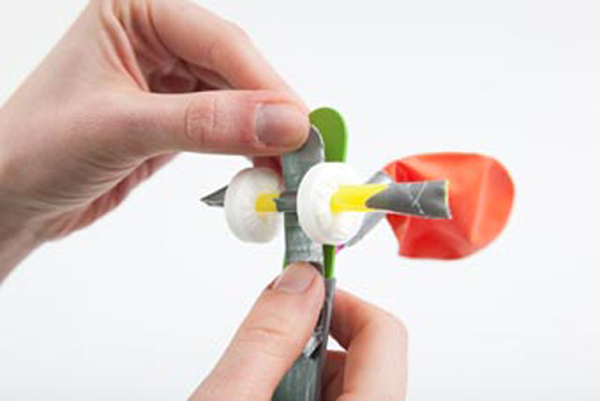 See written instructions for Steve Spangler's balloon car (featured above) as well as more racing toy experiments here. Aso check out Design Squad's 2 wheel (made with life savers candy) and 4 wheel balloon car! ¡Great, I´ll try to make one, thank you!